"I love my body, I LOVE my Electric Body," said Aly Cook recently in an interview. 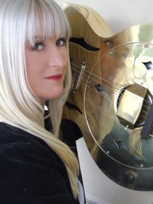 Nominated for NZ Female Country Artist of the year Aly Cook is a Country Blues Singer who has used Electric Body for over 2 years. Aly suffers from a condition known as acne rosacea and has found using Electric Body Skin Elixir means she can give away the use of antibiotics and harsh skin medication to keep the condition under control. It was such a pleasure meeting you. I am so excited about the product. It still takes some getting used to not having to use a ton of other products, but I am enjoying the simplicity of the three products. I love the way my skin feels. The skin elixir is so amazing. Sometimes throughout the day I will touch my face and my skin just feels amazing. Even with oily skin, I don't even have to blot, maybe a touch up near the end of the day. Using sunscreen, and moisturizers just added to the oil production my skin makes naturally. But I check throughout the day and my skin seems to have normalized immediately. Also the body spray, OMG!!!! I use that when I get out of the shower and my skin stays moisturized into the next day. I'm not oily or ashy. I have literally stopped using any oils or lotions, period. I am so excited about this product. I will forever endorse Electric Body as my skincare line of choice. And the science behind this product is phenomenal. When people hear the word cancer it gets their attention. I use the product because of the overwhelming benefits and ease or simplicity. The medical benefits for me is a plus. So, thank you for bringing this product to market and may you and Denie have massive success because of your passion for making a difference. Thank you for sharing. Author of The CEO in You: From the Boardroom to the Bedroom...order your copy today! This is the end result after the Mohs forehead flap surgery to reconstruct my nose after excision on infiltrating Basal Cell Carcinoma on the right side of my nose. Thank you so much for your magical healing cream. Even after only using it for 4 days the redness lessened and the scar wasn’t as obvious as previously. It's been a long hard haul but I have come out the other side and will continue to use the Skin Elixir. "I just love your Skin Elixir! My skin has never felt so smooth! And i am amazed at how it increases my energy. If I ever need a pick-me-up I just apply the Skin Elixir and I feel an instant revitalization! Magical!" Andy, creator of "Tow Truck in a Box"
"The comments below affirm to me that I have achieved what I intended to do - create a non-cancer causing, healthy skin care line to help make this world healthier and safer for everyone - men, women and children. All the comments below are unsolicited and from the heart." "I must tell you a little story about the Body Spray. My children and I have just come back from 6 weeks in Northern Europe. I was wearing the spray every day and got a lot of comments about how nice my legs looked, which was really nice! The most amazing thing though, was that, while we were out in the forest at night when everybody covers up so they don’t get eaten alive by mosquitoes, I was still walking around in my shorts! The odd mozzie landed on me, but quickly took off again – I reckon that spray doesn’t only make you look good, it is also a secret weapon against mozzies!! I put it on my kids, and same thing happened. I offered other people to use it, which they did, but even though they didn’t get bitten when they were wearing it, they struggled to believe that the beautiful “orange spray” could chase away the dreaded insects. Funny, though!" A happy customer. "I love your products and you guys are inspirational! I am so happy with the cream and I love the way it helps my sensitive complexion. Whenever I have a rash or my son's skin is irritated it clears up overnight!" Valentina, Model. "I just love Electric Body and so does my baby Bella. The Skin Elixir works wonders if she ever gets any nappy rash. I haven?t even got any stretch marks because I have been using the Body Spray every day. And the Body Polish is a great product too - I use it as a facial cleanser and also in the bath. It?s great to know that all of these products are safe for me and my baby. I don?t have to worry about my little girl getting any in her mouth by mistake. I am going to tell all my friends with babies that they simply have to get it!" Denie, I just had to THANK YOU so much for creating this phenomenal skin elixir, I love it! I just turned 40 and have tried many products and nothing has ever made my skin feel and look so healthy and vibrant. It is really amazing how I felt it immediately. I was very happy to see that it reduced an old childhood scar which is now barely visible. Plus, I just love that every day I am putting something on my skin that is pure, alive and good for me. I will be spreading the word to everybody I know especially since everyone is noticing the difference and asking what I?ve been using. Please feel free to post this and my picture on your website. From the very first time I used this incredible skin cream, I was struck by the wonderful scent - delicious enough to want to eat, yet scented enough to retain it?s appeal to a woman. It takes only a drop and yet moves over one?s entire face so effortlessly. The feeling it leaves on my skin is nourished and protected. I have used just about every expensive European skin cream in my lifetime, but remain a firm devotee of this product from here on. I am continually astounded by its simplicity ?and its complex ability to be effective. Thank you for taking such good care of me and my skin. 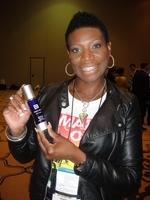 "I was introduced to the Electric Body products in May 2008. I am especially thankful for the skin elixir cream. Eighteen months prior for no apparent reason my eyelids and the skin under my eyes became swollen, red and extremely painful. Even water made the skin sting. I tried numerous allopathic and expensive skin creams however there was absolutely no improvement. After one application of the skin elixir, the irritation calmed down and within days the redness and swelling was gone. The overall tone of my skin has improved. I am absolutely delighted with all of these products." "I have been in the beauty industry for more than 35 years and have never used any skincare whatsoever until I discovered Electric Body. Now I use the Skin Elixir and Body Spray daily and everyone is commenting on how wonderful my skin is looking. I am also an avid golfer but do not like using sunscreen. I have found that if I apply the Skin Elixir before I go out to play and then at night when I get home I never have any sunburn and my skin continues to look healthy and nourished regardless of how many hours in the sun I spend - and I live in California!" Richard, Marina del Rey, California. "To Electric Body, Thank you for this fabulous Electric Body skin cream. I live in the desert, enjoy time outdoors and have discovered how well Electric Body replenishes and hydrates, eliminating dryness, weathering and adds protection from sun damage. Also, I have chemical and fragrance sensitivities and have had difficulties finding a product that works and is natural. The colostrum works like a miracle! My skin texture is softer and finer and often people remark that it "glows". It feels nourishing and revitalizing just putting it on my face! I?ve also used it successfully on cuts, cold sores and skin blemishes. I heal very quickly by using the product and I?m thrilled when I travel that I only need to bring one skin cream to do everything. Please let me know when the body spray is available! Again, thank you for helping me look younger and vibrant." "I?m addicted! I have never felt this way about a product before! I get into a panic if I discover my bottle is almost finished!" My name is Chrissie. I am 41years old and grew up in Ponsonby. The reason I am writing this is while camping over the holidays we went golfing and I got hit just above my right eye by a golf ball! It was a great sunny day, while we were on the green of the seventh hole a group of men teed off while we were still putting and the ball hit me right on my forehead. I started to bleed. People came over to help, including Denie & Shelley Hiestand, and I was rushed to Waipu Medical Centre to have 5 stitches to my gaping wound. I was so worried about my face and that I was going to have a scar. My job is Business Developer and I have to deal with people directly every day. Denie and Shelley gave me a bottle of their Electric Body Skin Elixir to use to help me recover. The next day I had two black eyes. This happened on the 4th Jan 07. I still can?t believe how well the Electric Body skin repair cream worked! It?s a miracle! After ten days you wouldn?t know that I had had black eyes and stitches. And even better is that it is chemical free, non-toxic, child safe cream you can apply to any skin type. It is not only a fabulous skin repair cream but primarily it is a beauty cream that helps create healthy skin, reduce fine lines and wrinkles and it really has made my skin glow. I feel that every household should have this product! Thank you so much Denie and Shelley for introducing me to Electric Body. "I loved meeting you both in Los Angeles at the Emmys. Thank you for the incredible healing session Denie. As soon as I saw a friend of mine here, she said my energy was stronger - amazing. I feel happier. I also had a really bad pain down my left side and put some of the Electric Body on it last night and it really helped - am amazed again." At the age of 70 yrs plus, have had so many compliments about my glowing skin - "have you had botox?" Since using this absolutely amazing electrically formulated skin care cream, fine lines have disappeared, elasticity gained, and particuarly the "glow". Thank you for making me feel so alive and active." "Thanks for creating such a fabulous natural skin product. Childhood eczema caused my facial skin to be dry and overly sensitive to any skin cream. I have been using your Electrical Formulated skin cream for over a year now and my skin has been nourished back to a healthy look. It is very economical and I have been recommending your skin cream to my clients and the feedback has been very positive." "For my 60th birthday recently, I indulged myself by bathing Cleopatra style using the Electric Body ?Body Polish?. Pure bliss! Cleopatra bathing is now a regular part of my life. I recommend everyone not to wait until you are 60 to exeperience this! Indulge yourself now!" "After reading ?Electrical Nutrition? I became aware of the FACT that my body is the vessel in which I have only one opportunity to experience my life through. It was an immediate wake-up call that I needed to make some simple, yet extremely important changes in my day-to-day routine if I was going to avoid illness brought on by my own ignorance or the idea that someone else such as my doctor, should be responsible for knowing all right things to make me well when something mysteriously showed up. The way to a healthy life, is to avoid treating your body in such a way that you unable it to perform the functions that were intended in its design. Therefore, it only makes sense to me, to avoid foods that have no nutritional value and to avoid the toxic chemicals in everything from soaps, detergents, and by far the most damaging, the make-up and skin care products that we are using. These products are only helping to fuel the overload of toxic conditions that our bodies are constantly attempting to fight off. It?s true that we cannot avoid all of it, but doesn?t the responsibility of our own individual health start with us, and the awareness that we are literally poisoning ourselves by the use of skin care products that we apply to our skin every day? My hope is to encourage people to begin to start thinking about these things and help ourselves in an effort to become healthier and happier people. Health is where it starts, and my connection to Denie Hiestand and the information in his books regarding nutrition, as well as the supplements and the truly amazing ?Electric Body Skin Elixir? that I have been using for the last 2 years, has all contributed to so much more vitality and wellness in my life, it?s truly amazing!!!" "I?ve known Denie for 10 years and studied with him off and on over that period of time. I can attest to his integrity as well as his fund of knowledge and the acuity of his insights. I?m constantly amazed at the depth of his understanding of human physiology and how our bodies work. The natural health products that he has endorsed and developed over the years have consistently proven to be useful and effective in maintaining and restoring health. This guy really knows what he?s talking about." "I just want to thank you so much for giving me the Electric Body Skin Elixir at the Emmy?s. I really love it and have told all the girls on the show about it. It is my favorte product and I have tried them all. The results for me have been even toned clearer skin. I really appreciate it!" Katie Cleary from "Deal or No Deal" Bag #11. "I have been using Electric Body Skin Elixir for over two years now and I will never use anything else. Not only does it feel divine, but my skin has never been softer. I am very conscious of looking after my skin, preventing the aging process as much as possible and didn?t want to use a product containing chemicals that could be harmful to my health. So I was delighted to discover Electric Body? - the only skin care product that actually lives up to it?s name of "all natural" and contains live Colostrum to regenerate my skin." "I used the Skin Elixir on my wrist to help it recover from the injury I got when I cut my tendons on my wrist on the lid of a tin can while stuffing the garbage bag and the doctor couldn?t believe how well it had healed up!" "Because I work in the steel industry my face and hands get exposed to a very harsh environment making them rough and hard. Since using the skin elixir at the end of the day, my skin has regained it?s normal condition and softness; and thus the appreciation of my girlfriend. I have also found it beneficial on cuts,sunburns and heat rashes." Glad to hear that you are making progress with your skin care products - you have so much energy and enthusiasm to succeed in whatever is your interest. I love using the two products. Warm regards. I love Electric Body! Especially on my nappy rash! And my Mommy knows it is good for me! "My surgeon couldn?t believe how the scar from my shoulder operation healed up so quickly! I told him it was the magic cream I was using - Electric Body!" sensitive to the cold weather. smoother, more hydrated and toned than with other products. Martha Massage Therapist Los Angeles, Ca. and I am 56 years old! I use the skin cream twice a day. I love it!" I have not had a blister for years, but the other day, when getting ready to go on a round the world trip with my 11 year old daughter Maniana, I must have gotten a bit stressed and sure enough, the old virus was still in the cellular memory and I could feel a fever blister coming on inside my upper lip... I know that by the time I could feel it like that, there was absolutely nothing that could stop it! I put EB on it 3 x day for a couple of days and to my absolute amazement the blister never eventuated!!! Thank you so much for this amazingly versatile product -I love it! I wanted to tell of my experience with Electric Body. I have a skin condition called acne rosacea for which I take a course of antibiotics for 3 months yearly this keeps it at bay and I have to be very careful what I use on my skin. I?ve used Electric Body on it for a week... I cannot believe the results !!! No acne medication works anything like this stuff ...I put it on an what was the beginning of a rosacea outbreak and it killed it, like over night the pain was gone out of it and the blemish has faded back away and gone.. 2 days later !!! My hubby couldn?t believe it either so.. he has psoriasis... So what we are doing is putting a little bit on his right elbow every night and his regular medication on the other to see if it works .. Will let you know the outcome .. I am completely sold .. !! "I recently shared my Skin Elixir with a firefighter in our area who was suffering from a severe case of poison oak. He had tried everything and nothing helped. After one application of the Skin Elixir he felt immediate relief! Now I totally get why you say it is an everything cream that no-one should be without!" skin feeling refreshed and rejuvenated but not oily at all. J?ai obtenu un ?chantillon de votre cr?me par mon fr?re qui vie aux Etats Unis. J?ai une peau tr?s sensible sur le visage qui ne supporte aucune cr?me, elles sont rejet?es par ma peau. J?ai essaye votre cr?me est elle est fantastique. Ma peau l?absorbe imm?diatement. J?habite a Draguignan et il y fait tr?s froid durant hivers, ma peau ne dess?che pas et reste prot?g?e contre le froid. R?cemment, je me suis brul?e la main avec de l?eau chaude, j?ai appliqu? votre cr?me et ma peau a gu?ri si rapidement que j?avais du mal a y croire. En quelques jours, il n?y avais plus aucune trace ni cicatrice. Je vous remercie d?avoir cr?e cette cr?me qui a changer ma vie. Hello, I obtained a bottle of your cream from my brother who lives in America. I have very sensitive skin on my face and have never found a cream that works that my body doesn?t reject. I tried your cream and it is fantastic. My skin absorbed it immediately. I live in Draguignan which is very cold in winter but my skin no longer feels dry and feels protected from the cold. Recently I burnt my hand and applied your cream to my skin and I couldn?t believe how quickly it healed. It only took a few days and I don?t have any trace of a scar. Thank you for creating this cream that has changed my life. eyes and there was no stinging sensation or reaction at all. Peter Civil Engineer Long Beach, CA. Wir leben auf 1500 m Hhe .M. in den Schweizer Alpen. Die Luft ist hier wegen der kalten Nchte oft sehr trocken. Bei Nebel in den Tlern sind wir meistens in intensiver Sonne. Fr die Haut, besonders fr das Gesicht, brauchen wir ber das ganze Jahr einen besonders guten Schutz. Die "Electric Body skin elixir" erfllt diese Anforderungen perfekt. Wir fhlen uns gut geschtzt und frisch belebt. We live on 4900 ft in the Swiss Alps. The air here is mostly very dry due to the cold nights. With fog in the valleys we are exposed to intensive sun radiation. Thus we require special skin protection all year round, especially for the face. "Electric Body skin elixir" provides this requirement in a perfect way. We feel well protected and always freshly revived. me on all my trips... I use it on my face all the time. definitely noticed it?s making me look A LOT younger. one in my suitcase and one in my carry on, just in case they lose my luggage. and feeling healthier. I?m very impressed. It works great!" For the past 25 years I have had a challenge with the herpes virus. As soon as I get somehow depleted or stressed it will come up at the bottom of my spine and turn into a very painful blister that would hurt me for several days, up to several weeks in extreme cases. The other day it happened again that I got myself stressed and sure enough, the feeling of the blister started and I thought of putting on the EB skin elixir.To my total amazement the blister never progressed and the cream seemed to keep it under total control and after only a couple of days the whole episode was over. Thank you so much for your wonderful product! My 81 year old mother-in-law in New Zealand keeps begging me to try Electric Body. She says everyone keeps telling her how wonderful she is looking and younger too! I can?t wait to tell all my clients about Electric Body. What you say makes total sense! I am going to have to throw all my other products out! "I am so happy that Denie has created such an amazing face and eye cream. I use it every morning and evening, and several times throughout the day too. I am very conscious about what I put into my body and only feed it the best quality, organic, wholesome food. Now I am able to also feed my skin, the body?s largest organ, the best possible food it could have too - a pure and natural colostrum-based cream. My skin just loves it! It soaks it up and leaves me feeling revitalized and refreshed every time I use it. I have a strange mixture of dry and oily skin and the cream seems to very intelligently make the dry areas moist and the oily areas less oily! Magic! I use very little make-up as my skin tone is so beautiful without it now that I use the skin elixir, but if I do put make-up on, I use the skin elixir as a make-up remover at night before I go to bed. I dab a little extra around the eyes so that it can soak in while I sleep. It works great on any blemishes and has been amazing on sunburn as well. I highly recommend it anyone who is conscious about their health and well being. It is truly a non-chemical, non-toxic, pure and natural skin cream, and it works!" Upon trying Electric Body on my face and neck I found a renewed silkiness, regained the moisture only young vibrant skin possesses. My skin appears to be more resilient, having more elasticity, lessening the fine lines I once had. I recently had foot surgery and thought if Electric Body softened the fine lines on my face the way it did that it could possibly help reduce scaring and scar tissue, what a surprise to find my scar after just two weeks has almost disappeared with minimal scar tissue. Thanks Electric Body. "The first time I used Electric Body I couldn?t believe how it absorbed into my skin and made it FEEL so much smoother right after I put it on. best skin cream we have ever used. I?ve used other skin creams on my face for 18 years before Electric Body but I have to say that this stuff is great and the best I?ve ever used, hands down and I hope I?ll never be without it." I will definitely have another bottle of Electric Body. During my first week in Dunedin I scalded my hand really badly ? massive blister (about 5 cm!). As soon as the ugly weeping stage was over I started putting Electric Body on it and it has healed amazingly well. It looks like the scarring will be minimal so I am very impressed. "Whenever possible I use natural products for all aspects of my health. For 3 years now I have been using "Electric Body" Skin Elixir. Two applications daily, with outstanding results. My skin looks and feels firmer and more radiant. I definately feel younger for my 60 years." My wife?s mother (who is not given to spending money frivously) is completely sold on the product and wants to buy more. "Electric Body Skin Elixir is an absolutely divine product! I have very sensitive skin and live in a harsh winter climate; I use it daily around my eyes, and any area that is suffering, to soften the effects of weather or a decrease in my water intake! It?s my way of spoiling my skin when it?s tired and stressed or just needing some love. Like all the other Electrical Nutrition products I use regularly, Skin Elixir is a necessity in my cupboard." Thank you so much. On either side of the bridge of my nose I?ve had rough erupting skin upon which I?ve tried everything I?ve been able to find as "natural" all to no avail, and have hidden it with make-up. Well now it?s clear and I feel like a new woman! I received the face cream from you at beginning of May and have been using it for 3 weeks now. I have found it to be fabulous - my skin has never felt so soft, and blemishes are starting to disappear. Also a rash I had on my chin has completely disappeared. Am using it on the arms and legs and they have also softened! Thanks so much for creating such a wonderful product, as none of the other creams I?ve used have ever done this. cream heals it so fast, it?s unbelievable. the Electric Body Skin Elixir as a day and night cream. the Electric Body Skin Elixir is the answer. I have found the product excellent and so good for my skin as I?ve had a few treatments over the years including chemical peels and just recently IPL laser treatment. I?ve also been flying for Air NZ longhaul for 18 years and find in the 2 months I?ve used it, it has been a huge bonus for the ?cabin air?. Thanks again for a fantastic product. I got the elixer and I am thrilled! I will be in touch when I have response from the Spas and cosmetic dermatologists! I hope they like it as much as I do. "I?m 12 years old and I used the cream on some pimples I had on my head and it really helped. It?s also good on cuts and things." "Being a sailor and avid skier, and spending many countless hours with my skin being tormented by sun, sea, surf and wind, I started stealing my wifes skin products to alleviate the harshness that my skin felt. None seemed to work, so my brother, Denie, sent me his magic creation to try. The results were unbelievable and immediate on the first day. In fact, I was competing in a 3 day national regatta in extreme conditions with hot sun, salt spray and mast snapping wind. The application of Electric Body Skin Elixir left my skin feeling and looking better than if I had just come out of a very expensive spa treatment. I could not believe the difference it made. There was no windburn or other damaging evidence and my skin was soft and supple. I now use this skin elixir every day and particularly never travel to any regattas without it. ... and now I look much younger and better looking than my younger brother with the added advantage that my wife is much more touchy feely. Obviously, there are many advantages to this product." your skin does look good." I have been using Electric Body for almost two years and just love it. My skin feels sooo soft. I keep discovering new uses of Electric Body and wanted to let you know it really helped recently with a potential bladder infection. I have had a couple of bladder infections previously and can now feel it coming on. It usually starts with a vaginal itch and so I applied some of the Skin Elixir internally and got immediate relief. I continued to use it for another day and the bladder infection didn?t develop so I am amazed at speed at which it helped relieve the symptoms and stopped it developing. Thank you! You truly have created a magical cream that can be used everywhere and for everything!!! LOVE THE ELIXIR!!!!! Wow! What a product. Within such a short period I really feel it?s made a difference. I?ve spoken with the Director of our Surgery and told her after my customary 2 week trial, she will be getting my report and feedback...but I can assure you it?s very positive. My friend Sanda saw my skin and wanted to know the secret immediately. I gave her your website. Her husband is an acupuncturist and OMD and I?m sure will be very interested in the elixir. Cory, Aesthetic and Clinical Dermatology, Marina del Rey, California. she uses it everyday. I know it?s safe for her. Thank you Mum. I love you too." Your Skin Elixir smells de]ivine - I want to eat it! Feels smoothe. I?m on your website watching the interview on Heatbeat America .... very interesting.... I am so very proud seeing Denie on the TV - good on us Kiwis ah!! Woohooo well done guys. I am a product junkie but have never found anything that I could put around my very sensitive eyes until I discovered Electric Body Skin Elixir. It is the only product that works on my eyes decreasing environmental sensitivities from dry, or polluted environments. "Please send me another bottle of your Electric Body Skin Elixir. Have almost run out and just love using it especially after shaving!" I love the Electric Body cream. Found it is an incredible healing cream. Love only having to use one product and all the ease and convenience that creates - specially when travelling. It feels like rubbing goodness into my skin and gives me a real sense of well-being, like eating well. Am keen to buy more! I tell them, Electric Body Skin Elixir!" Electric Body is absolutely divine. It feels so alive on your skin. I wish you absolute success with all my heart. It is a great product and an absolute god-send for women. My Mum went back to the UK armed with 2 bottles. She.s going to give one to my sister-in-law who is an expert and wealth of information on skin care and anti-aging. This cream will be a revelation to her! Thank you! As a woman who has committed her life?s experience to only organic and natural remedies, it was a God-send to find a product such as this one! After years of not being able to use the myriad of creams that are marketed to women because of their chemical contents, this product has done more than just nourished my skin. It truly has worked a miracle in the field of healing. It?s sophisticated packaging, scent and feel would never lead one to believe that it had medicinal healing powers, but that is exactly the beauty of this amazing skin cream -? one product for every area of the face, and for every skin need - healing or enriching. Thank you for this miraculous product! "Thanks for sharing your skin elixir with the world! It?s been about a month since I have been using Electric Body as a face moisturizer. And let me tell you how impressed I am with it. It?s amazing!! I wish I hadn?t pick up another bottle of my regular moisturizer because that was a waste of money. I would rather have used the money for another bottle of Electric Body. complexion is clearer and smoother. My skin is more supple and toned. I feel like my face looks younger. My girlfriend even noticed. She kept staring at me in an odd way so I asked her what she was doing. She said that my face had a glow to it. Wow!! I feel there is HOPE. I have never felt this way about any other cream. I have always been such a skeptic. I always believed people with beautiful skin were either born with it or they went under the knife. Now, I feel there is hope for me! I can?t wait to see how I will look in another month. Thank you all for developing this amazing product!!" I want to be able to afford a life-times worth of Electric Body. God that stuff.s amazing! My wrinkles are d.i.s.a.p.p.e.a.r.i.n.g!!! My beloved says I look 10 years younger and that.s just as well coz for the first time I.m saying with a passion: .God I love this life so much I.m gonna swing it .till I.m 100!!! Thanks so much for creating and marketing such a gorgeous product. The skin on my face and neck has never been in such fantastic healthy condition. I am hooked! I have stopped using products with parabens thanks to EB. Not only is it a pleasure to use and applies nicely, but I have stopped wearing foundation because my skin glows with health! At 43 thats quite something! When I tell people Im not wearing makeup they are amazed. I could go on for hours about your product, but the reason Im emailing you is to ask how EB travels...I want to buy some for my Mum and Sister. I used the Electric Body Skin Elixir on my nose after having had surgery and skin grafts and now, after about 3 month, you cannot see any scarring or damaged tissue. Everyone is commenting on how good my skin looks and feels and my surgeon in Hamilton is amazed at the results. Thank you! I am now on a healthy path looking at everything I eat and put on my body to make sure it is chemical free and full of good healthy life-giving properties. My life has certainly taken a turn for the better. I have been using it on two sun spots I have on my hand and they have almost disappeared! It?s a fabulous product! Your product really CAN change the world. I know the fact that there is colostrum in the product means that it can do what you spoke of. I really appreciate the electric gift set. I have been using it and already feel a difference. There really is no product like it that I have tried. This is Nicole and Amy who you met at the Victoria Health Show last weekend. Thank you again for your time at the show and for creating Electric Body. We have used the Body Spray and Skin Elixir everyday. Both of us are thoroughly impressed with your products. We have learned quite a lot from the wonderful material on your website too. Thank you for your passion! Sweet Mary Jesus - I LOVE THIS FACE CREAM!!! AFTER ONE APPLICATION - I SEE AND FEEL THE DIFFERENCE. OH THANK THE HEAVENS FOR YOU PEOPLE! I haven?t written in all caps for years.....but I?m that excited. thing for my almost 35 year old face that has just started showing its age. I have found it. For life. What a relief! I love the skincare line! I can?t believe how great it smells, how good it feels and the fact that I know it was designed to help women. I wanted to write and say what a pleasure it was to meet you, such a positive energy. Unique in so many ways, and fun too. Most people don?t realize how they are in control of their life, if they paid attention to what they put in and on their bodies. The packaging of the Skin Elixir is wonderful, and the pump gives the right amount. Bravo! I love how it smells and feels. After using the EB face cream I really notice a difference going back to the Sothy?s products I was using before. I can?t wait to get more Electric Body. Thank you for sending it to China for me. Thank you for the cream! I?m sure you won?t be surprised to hear this but the cream almost cleared up my eczema in just a couple of days! Recently I met Denie up at Monterey and he said the Skin Elixir was basically good for everything - a first aid kit in a bottle. I had first hand experience of that with my young son who had extremely itchy irritated feet due to a reaction. I immediately applied the cream and the itching disappeared immediately. He has also had a dry patch of skin on his face that has never gone away, no matter what I tried, and after one application of Skin Elixir before he went to sleep it disappeared overnight! - I?m sold! When I was in Germany I was asked about my energy and my skin. I spoke at length about you both, Electric Body, etc. etc.. One lady from England is a healing client and I have her a sample to use along with a session. I just got this email: Dear Shala, Just want to thank you again for the information you gave me in Germany. I have been using the body electric elixir for 2 days and am already noticing a difference in my skin. My daughter Katie use the Skin Elixir on a recent outbreak of herpes on her lips and was amazed at how quickly it healed up! I cannot believe how quickly my lips healed by using the Skin Elixir on them after I had permanent tatooing done to them. What normally takes 3 days healed up overnight! Amazing! Electric Body, Inc. makes no claims in regards to disease, prevention or cures pertaining to the products listed on this website, as per FDA regulations. All the comments on this website are the personally held beliefs of the people concerned. © Copyright 2008. Electric Body, Inc.